Bruising and swelling are common side effects of many aesthetic and cosmetic injection procedures. • Auriderm helps to improve the unsightly appearance of post-procedure bruises. • Perfect for bruising caused by cosmetic injections. • Tissue trauma often occurs during cosmetic injections, causing blood to seep from the blood vessels. The use of Auriderm post-op gel helps the body reabsorb the blood more quickly. • Auriderm’s Vitamin K Oxide activates the body’s natural healing process to help eliminate the unsightly discolorations in half the normal time. 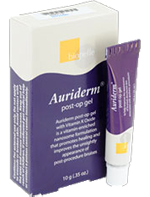 *Auriderm® post-op gel is also our Product of the Month for March – All Dazzlers will receive 20% off their purchase of Auriderm!